Beginning with some new boots models in the 2018 lineup, REVIT has a new size conversion chart. The chart is listed below. Generally speaking, the boots run smaller than in past seasons for a given size. Their new chart reflects the smaller sizing. Using the new chart, you’ll be buying a boot that is 1/2 to one size bigger than you might have chosen by using the conversion in past years. We tried on this model and confirmed the smaller fit. Our fit advice is to use the chart below to choose an EU size based upon your US street shoe size, while keeping in mind you maybe be choosing one size larger than you may have bought from REVIT in past seasons. In trying on my size in this boot, I found it to feel just a smidge (a technical measure of boot fit) bigger than the others we’ve sampled this year. So if you find yourself between sizes, go smaller. 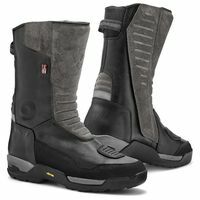 REVIT’s Gravel Outdry boot is their “best” waterproofing technology in a boot that could work for street or even adventure riding. Compare this to REVITs Trail H2O which has a VERY similar feature list. The Gravel uses Outdry bonded waterproofing technology as compared to the more standard Hydratex waterproof lining in the Trail. Here’s part of my comments on the Trail H2O which can also describe the basics of this boot: This boot is mainly leather along with some other man-made parts. There is an accordion fabric panel in the instep to make this boot easier to flex and walk in and the shin area is a black suede material (mostly for style I think). These boots are easy to put on and take off with the usual side zipper, and you’ll see the side zipper is blue! I kinda like that. The sole of the boot is extremely stiff (which is a good thing for a riding boot). Its made by Vibram and its a “system” including the middle layers the tread and the insole. I think everybody has heard of Vibram and this isn’t their first rodeo, so I feel comfortable with this design. The heel area and the toe box are stiff and should hold up to shifting easily. And there are two round protectors built into either side the ankle for impact protection in those areas. The shin is well armored with a stiff material under the suede outside. The shin protection is the main advantage of a taller boot like this as compared to a hiker height boot. Also, a taller boot is better at keeping water from entering the boot over the top. Speaking of which, a waterproof liner is installed in this boot so feel free to choose this one if you anticipate riding in rain. Why is this boot a premium priced product? This boot uses Outdry technology to make it waterproof. The Outdry liner is the “bonded” type so that it is bonded on the back side of the boot’s upper. This type of liner will keep water out of the boot and also out of the back side of the upper which can occur on boots with the traditional waterproof liner that is sewn in place between the boot’s upper and inner liner. Granted, this is a subtle difference, but it is widely acknowledged that a bonded type waterproof liner is a superior setup as compared to the separate waterproof liner. As they say at Walmart, “compare to GoreTex”.